After three tries, a history buff has successfully recreated a (scale-model) piece of America's past that looks like it was taken from Crimson Skies. When most people retire, they take up hobbies like bird-watching, golf, and watercolor painting. 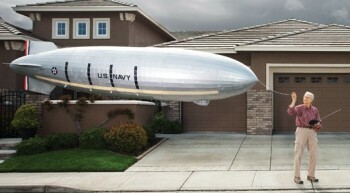 For retired computer engineer Jack Clemens, though, making scale-model replicas of the USS Macon (a helium-filled Navy airship that was wrecked in 1935). The latest version is twenty-feet-long, radio-controlled, and fills up his entire garage. Clemens was inspired to start making the replicas because he used to regularly commute past the Macon's old hangar in Moffett Field, California. Eventually, the man decided he wanted to create a scale model that he could return to the hangar (few remains from the Macon are still around, since the airship crashed in the ocean and the wreck's location is kept a secret). Clemens decided that his replica had to be as accurately-detailed as possible, so he requested the plans from the Smithsonian National Air and Space Museum. Clemens then set about building the replica; it took him three separate tries. The first time, his cat jumped on the model from a high shelf and wound up ruining the ship's hull (thus proving that the full-size airship would fare poorly against giant monsters). The second time (in 2008), Clemens completed the replica but it was destroyed during a particularly windy test flight. This is third time Clemens has worked on the replica, and it seems like it's the charm: Not only is the replica totally detail-accurate (having been completed from thousands of pieces of balsa wood and sheathed in mylar), but it only needs a single 2.5 oz battery to power the eight small propellers that allow it to fly. Clemens' replica is housed in his garage, where he claims, "It's the bane of my wife's existence." However, he's offered to donate his creation to a museum that's currently being constructed in Moffett Field. He's also hoping that he'll get to fly the replica in the Macon's original hanger. Here's hoping his dream comes true.